The exterior of Sensi is as beautiful as the interior. 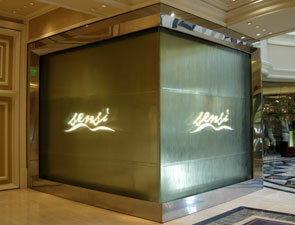 Situated in the Spa Tower of the Bellagio, the first thing you'll note, if you approach from one side, is the beautiful glass behind which is a continuous waterfall that runs over the luminescent Sensi logo. If you approach from the other side, meanwhile, you'll see the bar, which features an infinity waterfall that runs over black granite walls that separate the bar from the main hallways. As you approach the main entrance from either side you'll see large glass picture windows and the entryway, which is framed by honey-colored wood on either side. Inside is the stone sensation that is Sensi. The hallway itself has a dramatic floral arrangement directly opposite the entrance. The picture windows and entryway are actually concave. Once you make your way near them, you can see the stone for which the restaurant is so famous, of which the hostess station is built. Take a walk around the kitchen and you'll see multiple racks of wine bottles; stroll a little further and you'll also see fresh shellfish on ice. It's all there for you to look at while you decide, "What is it that I want tonight?" 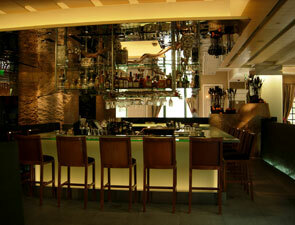 Sensi's bar is off to the right side as you enter the restaurant. It's open on two sides to the hotel walkway and there's an infinity waterfall inside that cascades over the top of a black granite divider that borders said walkway. The bar is square and covered in glass, providing a modern feel. It's luminous on the bottom, with wood and leather armless chairs on all four sides, about five on each side. If you happen to be walking through the Spa Tower, you can take a look in and see what's happening. Striking flowers adorn the corners of the bar while a mirrored ceiling adorns it overhead along with open cabinets, inside of which is glass shelving that holds bottles of liquor. Beneath these shelves is a rack that holds the glasses by the bottom of their stems. The cabinets are adorned with pieces of driftwood and containers of stones that continue the restaurant's stone and water garden theme.